That is a mid 1970 cab, definitely not a 68. It has been retolexed and the white piping is not original. The main thing going for it is the original grill material, the script logo probably original too. The speakers do not look original to me, pre-rola T1281's do not usually have labels, so those are probably T1217s or something. It is really a "players grade" cab so don't spend too much on it. Although the original grill is the most important thing when it comes to keeping the original sound of the cab. 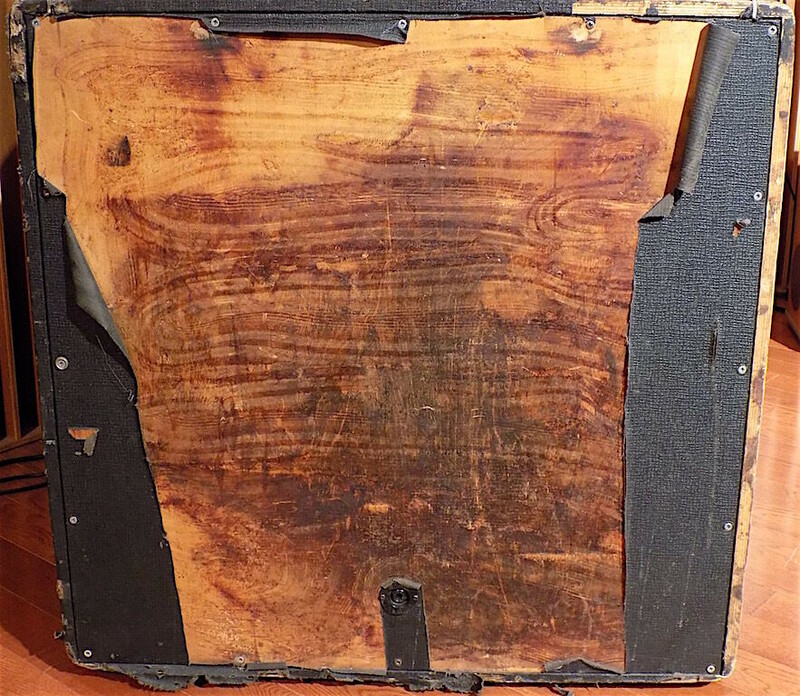 Make sure the speakers work properly, especially with the cab being in such rough condition. If they have any major issues they are near worthless in my opinion and will likely sound crap. The speakers look like they have probably been reconed, especially the bottom two, judging by the markings on the frames, so check that out too. Thanks for the reply. The speakers have all been re coned. At the time they were purchased they were blown and re coned with British NOS re cone kits at Musical Exchange in early 80’s. Allegedly G12H30-55hz. What would you say would be too much money ? Well, the empty cab without speakers, personally I would not pay more than £350 GBP for it (approx 460 USD). It is too rough to be worth much in my opinion, like I said the grill is about the best thing going for it. Without that, there is very little 'collector value' there at all. It's a players cab, or 'workhorse'. Does the job and sounds good, but nobody wants it in their museum. It could be restored but it is a lot of work and additional expense, and would still not be worth the same as one in 100% original condition afterwards. Reconed speakers, their value depends on what type of cones they have, and whether they still work properly and sound good. They can still have issues such as coil rub, so always check. If they have fitted NOS pulsonics then they should retain some value, but pretty much anything else is going to be very detrimental. Some recones sound good, but some do not. If they are the waldom cones, forget it - they sound horrible. Bear in mind how much you can buy great sounding used chinese greenbacks for on ebay (about £40 GBP each? 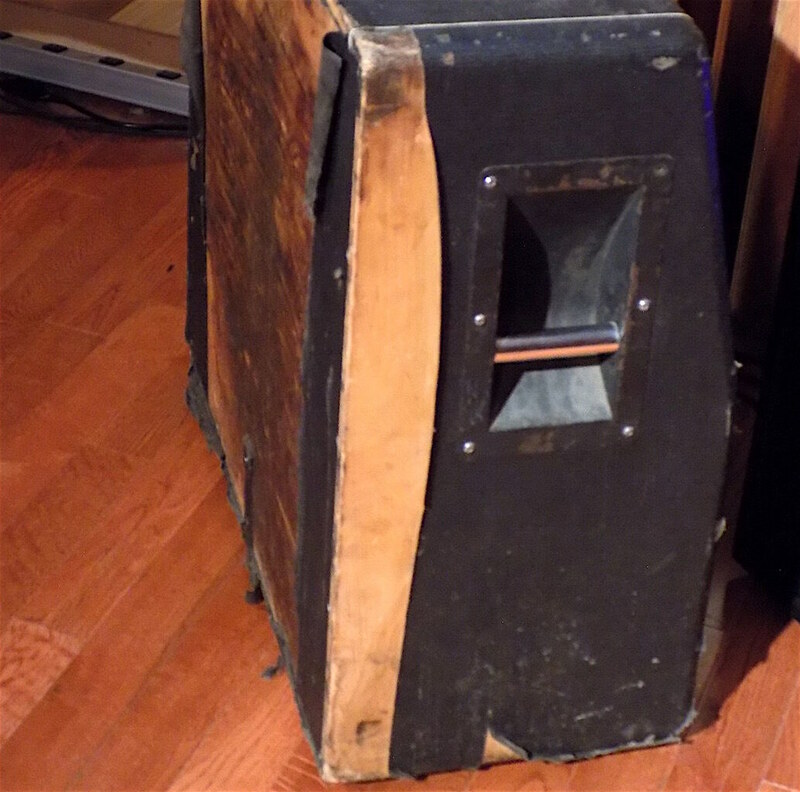 ), and would you honestly rather have reconed pre-rolas over some modern speakers? I wouldn't. So, lower end for the whole thing, maybe £500 GBP (approx 525 USD). A more optimistic price might be around £700 to £800 GBP (approx 1050 USD) if you can find someone crazy enough to pay it. Dealers are asking silly prices for any old crap thesedays. I've even seen some sellers asking top prices for reconed pre-rolas as if they were the mint original pulsonic cones They either dont understand where the value is, or they are real chancers hoping for a naive buyer to come along. Probably the latter. damn. I was hoping it was gonna be something worth picking up. I play out monthly so i don't want anything pristine, but unfortunately this doesn't seem like a smart purchase. It would be different if I was actually able to plug into it before buying, but that's not an option. shipping cost alone would be 200-300 USD. thanks for the help. Around $1750 USD plus shipping. Yeah VERY optimistic. 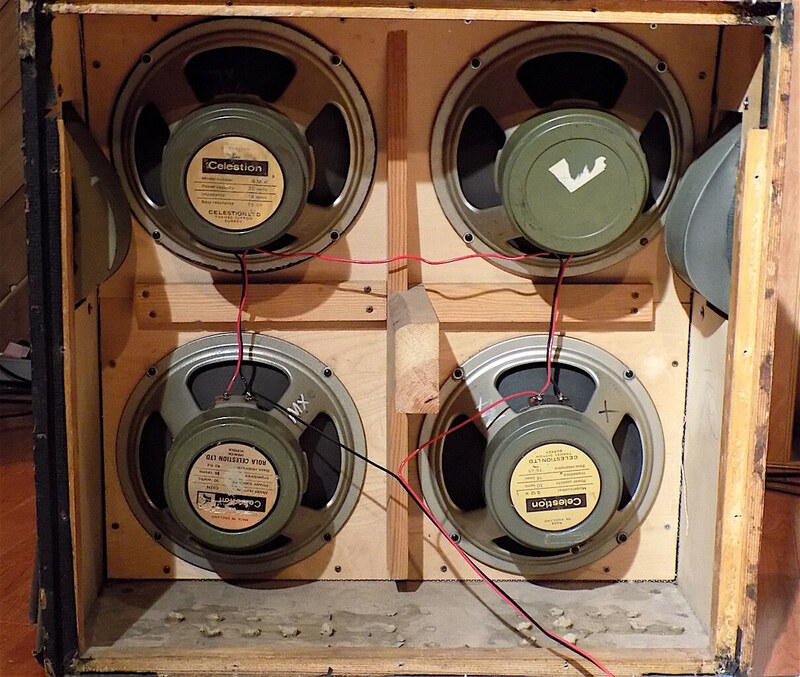 You could get a much nicer cab in original condition, with original speakers and original pulsonic cones for that price. I've sold pinstripe cabs for less. You cant blame people for asking these prices, when it sells they have the last laugh I guess, but good luck to anyone buying at that price, I just don't see the value there. Aspen is a nice guy, but he bought a container full of amps, cabs, speakers and stuff from the UK in the 80's, had it shipped back here, and he still had an incredible pile when I bought some old Celestions from him in 2003. I didn't need cabs, so I can't comment on what he had, or history, but there were a few old ones in the demo room. The right cab is out there, It just isn't for sale yet. 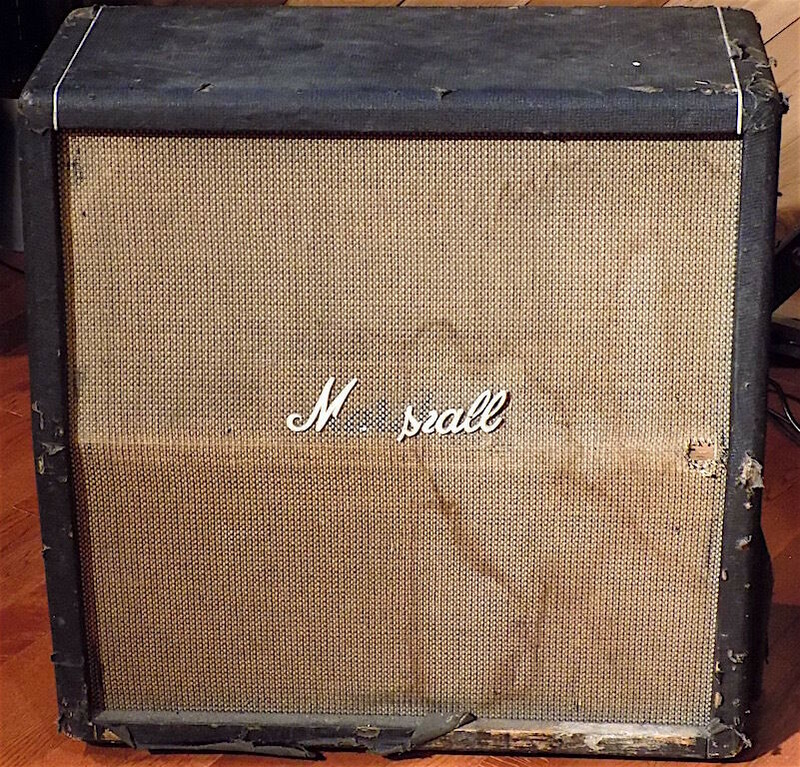 Somebody find me an empty 1968 Marshall Cab with original grill cloth in players grade condition.